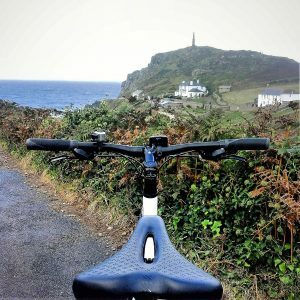 The Pendeen to Cape Cornwall cycle route includes coastal paths, an art gallery, stop offs for food and drink and a swim if you want. If you are here at the right time of year you could even watch some filming for Poldark. Starting off at Pendeen car park, just opposite Costcutter, which has the added bonus of being free and public toilets, you can pick up some supplies and then start your journey, (or you could wait till you get to St. Just where there are plenty of options). Turn left from the carpark and start cycling towards St. Just. You will cycle past the local primary school and The North Inn. After about 3/4mile you will go past Geevor Mine which was operational between 1901 and 1990. It is now a museum and heritage centre. Well worth a visit especially with young ones. There’s a café and tours of the mines. But might be best to wait till the end of your bike ride to visit as you will want to spend at least half a day there. Continue cycling through Carnyorth and you will come to a bend with a lane off it, this No Go By Lane. Take the lane on the left which has fantastic views of the coast on your right and the moors on your left. Be warned this is a very steep downhill lane and comes to a road junction at the bottom. or turn left through Tregeseal for about 0.3mile and look out for a footpath on your right. The views of Nancherrow from the path are worth the walk. St Just is the first and last town in England. It has its own very distinctive character and worth spending some time there. It has 4 pubs all in the centre all serve food and drink except The Star Inn which is a well preserved traditional Cornish pub but only serves beverages. St Just has several cafes for food and drink, if you are peckish and want a bite to eat or a cream tea try The Cook Book which was rated in the top 6 best cream teas in Cornwall. You will find The Cook Book on Cape Cornwall Street, its not hard to find and they will provide a picnic with notice. If you are feeling up for some culture, why don’t you visit The Jackson Foundation. Nestled down a side street just off Bank Square, The Jackson Foundation is the art gallery of Kurt Jackson whose art work focuses on capturing the beauty of the Cot Valley. 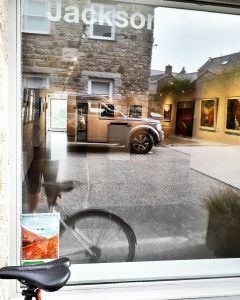 Entry to the gallery is free and has cycle racks outside to lock up your bikes. Once you are ready to move on either with your picnic or having had a Guinness at The Star look for Cape Cornwall Street (opposite the Post Office). Cycle down Cape Cornwall Street, past the secondary school and look for the sign for Carn Gloose on your left. 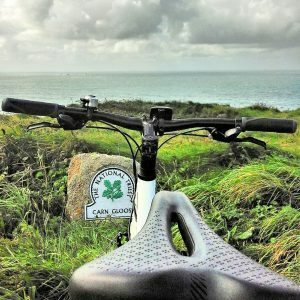 Cycle down Carn Gloose Road and you come to the coast, with spectacular views of Sennen to the south and Cape Cornwall to the north. At the bottom you will see Ballowall Barrow, which is one of the oldest funerary monuments in Cornwall. 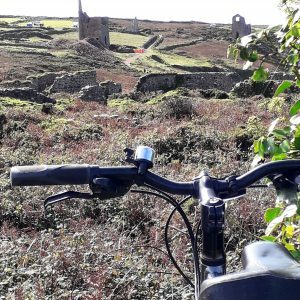 Once you have taken in the views and explored the history then take your bikes along the track down to Cape Cornwall. (This is a rough track and best suited for a mountain bike if you want to cycle otherwise you may prefer to walk it and push your bike). As you walk down the track you have Cape Cornwall Golf Club on your right, and at the bottom of the track you come to a small fishing cove, Priest Cove. If the weather permits there is a small lido which has been carved out of the rocks. It is perfect for paddling in when the tide is out. Priests Cove offers up fantastic snorkelling opportunities when the sea is calm. Out at sea you will sea a small island, called The Brisons which is often said to look like “Charles de Gaulle in his bath”. 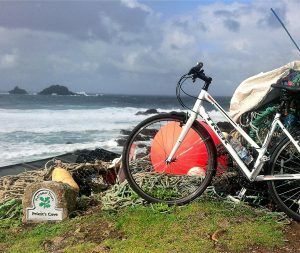 As you go up towards The Cape itself you can lock up the bikes in the National Trust car park and walk up the coastal path to the Cape Cornwall Lookout Station, the most Westerly National Coastguard station on the UK mainland. The National Trust car park has toilets and in the summer there is the Cape Shack which provides beautiful home made cakes, real local ice cream and a decent mug of tea for a decent price. Onwards back towards Pendeen, cycle up Cape Cornwall Road back to St. Just. Turn left down Nancherrow Hill, take care this is a very steep hill, and continue up the road to Botallack. You will come to a left turn which takes you into Botallack past The Queens Arms and onwards to the coastal path. Be warned you are now entering Poldark country. Botallack is an old mine which is one of the modern wonders of the world. The Crowns, are mines built into the cliffs. Visit the Count House Workshop it is the perfect place to stop and find out more about Cornish mining. Why not do it over a cup of tea and cake. This is also the location, for Poldark fans, of the fictitious Wheal Leisure, the family mine of Ross Poldark. Follow the coastal path from Botallack to Levant Mine. The path is cyclable on a mountain bike, (hybrid cyclist might want to walk the beautiful coastal path). Either way, once you are back on the main road (the B3306) you are on your way back to the car park at Pendeen. The cycle time is 1 hour 10minutes. This cycle ride could be much longer if you take in all the attractions on the way. The time could be hours and great day out..